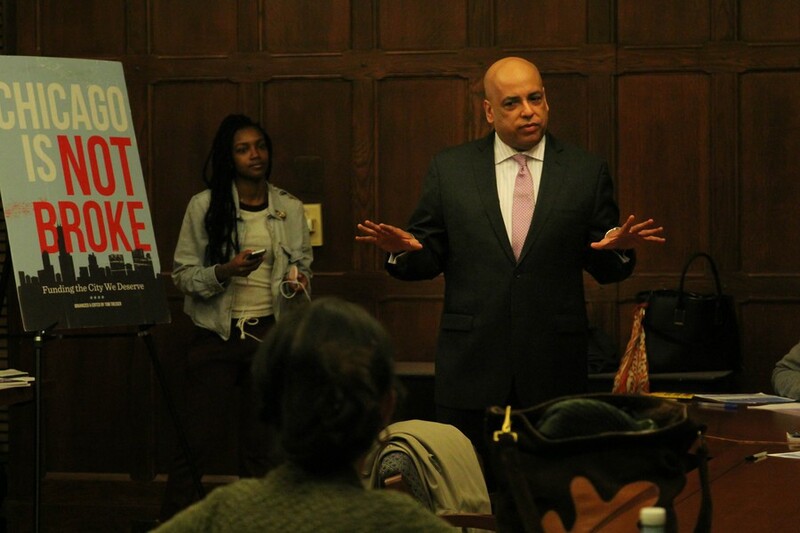 Fourth ward aldermanic candidate Gerald Scott McCarthy speaks at a forum in Chapin Hall on February 23. The Fourth Ward Aldermanic special election is today. Here is a guide to all the candidates, their backgrounds, and their policies. The Fourth Ward stretches from portions of East 55th street to the South Loop district near South Michigan Avenue. King is the current Fourth Ward alderman, a position she was appointed to by Chicago Mayor Rahm Emanuel last April. King grew up in Evanston, IL. Before her political career, she owned a small business for five years in the Fourth Ward. King also founded the nonprofit organization Harriet’s Daughters to increase employment and wealth in the black community. She is a longtime friend of the Obamas and received an endorsement from Barack Obama late last month. As alderman, King has worked with Third Ward Alderman Pat Dowell to create a “Safe Summer” program and collaborated with local principals to build a Fourth Ward sports program in hopes of keeping kids in the ward safe. She has also restored weekend bus services on 39th and 43rd streets. King opposes building a new city-run casino in Bronzeville, instead preferring a structure with residential, retail, and recreational services. In her view, this will be a better use of city property and will develop the culture of the Bronzeville area. Lucas is an attorney at the Peace of Mind Properties Law Office. She is also a small business owner in the ward. Lucas has four children who travel with her to various campaign events, such as the Kenwood Academy Forum held earlier this month. Her platform seeks to establish safety in the ward through communication and collaboration between the schools, park district, police, and the community as a whole. She wishes to develop small businesses in the ward and create jobs. She would create increased arts programs for students, and response programs for seniors. To remain transparent and responsive to the needs of the people, she hopes to hold weekly town hall meetings with residents. Lucas feels that development in the ward has been, so far, too focused on the upper edges of Hyde Park and the South Loop, and would like to see more of the new growth in Bronzeville and Oakland. Livingston says he would build more affordable housing in the Fourth Ward, along with developing the currently underused lakefront property. For the youth, he would fight against charter schools and for an elected school board, as well as decrease policing and increase investment in schools and jobs. He is committed to transparency, and would create an oversight committee to advise his decisions, and remain accessible to all citizens. McCarthy is a native Chicagoan, who grew up in K-Town and currently lives in Kenwood. He is one of the three attorneys in the race, and a father of one son. His platform features a six point plan for the Fourth Ward: Uplifting the Community, Community Preservation, Promoting Peace, Quality Public Education, Economic Sustainability, and Energy Efficient Living. Specifically, McCarthy sees safety concerns stemming from “empty corridors” in the ward as a major concern. To that end, he wants more quality development, better trained police officers, and more social programs for the youth. The last thing he says the ward needs is another fast-food restaurant, as that will only add to the problem. Moore was also born in Chicago, and has lived in the Fourth Ward for most of his life. An attorney with a background in consulting, Moore currently practices real estate and divorce law. He has three children who all attend or attended Chicago Public Schools. A major concern for Moore is crime and violence in the Fourth Ward. His solutions to the current safety issues have three parts: partnerships with CPD, community/block watch programs, and Chicago Alternative Policing Strategy participation from residents and businesses. Moore is also civically involved. He has supported community sports, youth health programming, mentoring for young women, and senior housing through his personal civic engagement. If elected alderman, he would continue to promote these programs and expand their scope with added resources.